Percy Hawkins was born in 1885 and baptised at St. Mark’s church, Reigate, in June. By the time he was five, he was living with his parents and his siblings Albert, Emily and Walter at 8, Limeworks Cottages. His father, Joseph, was a labourer and Percy and Albert went to Betchworth School. Joseph and his wife Mary would go on to have eight children altogether. By the time Percy was 16 he was working as a carter for the builder George Cummins who had a yard and a flourishing business on Pebblehill Road. In April 1909 Percy married Elizabeth Kimber and by 1911 they were living in 3, Coombe Cottages with their first child Ada who had been born in 1910. 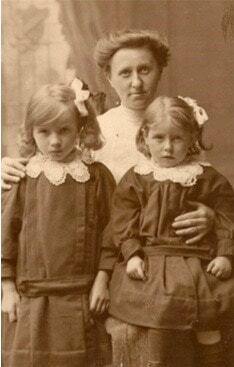 Percy and Elizabeth’s second child Elsie was born on September 15th 1912. 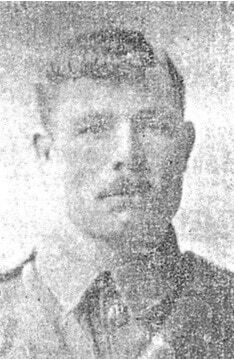 Percy Hawkins enlisted in the Royal Field Artillery in May 1916 and was sent to France as a Gunner in November of the same year. 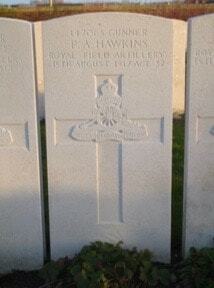 On August 15th 1917 during the third battle of Ypres, Percy Hawkins was killed by shell fire. He was buried in the Vlamertinghe New Military Cemetery, near Ieper (Ypres) which had been created in June 1917 in anticipation of large numbers of casualties when the Allied offensive began in July.